Discussion with Joey Hartman (Vancouver and District Labour Council) about Bangladesh factory collapse and solidarity strategies for improving working conditions. Imagine if your city government decided to take a public vote to determine whether you and your family members should have access to health care. 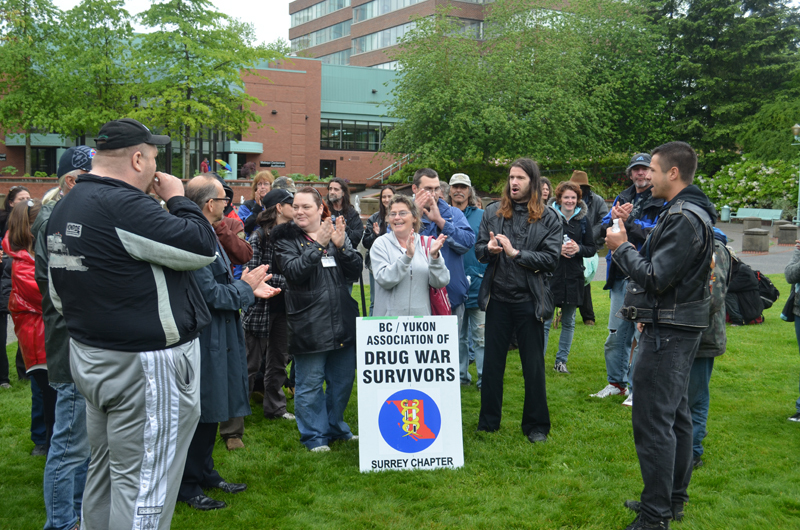 Scott Bernstein (Pivot Legal) explains this is why three individual drug users and an organization representing drug users in British Columbia have filed two legal actions against the City of Abbotsford challenging its 2005 “anti-harm reduction” bylaw. 1) a lawsuit in BC Supreme Court 2) a claim at the BC Human Rights Tribunal. We talk with Emilie Smith, an Anglican priest who has spent much of her life working with the Maya in Guatamala, about the annulment of the conviction of former President General Rios Montt for mass killings and genocide. Teachers who wore campaign buttons to school five years ago and posted political messages on classroom doors were exercising their right to free expression in a way that did not detract from their students’ education, the B.C. Court of Appeal ruled Tuesday, .Janet Steffenhagen of the Vancouver Sun, reports. CBC is reporting Surrey RCMP are investigating an alleged racist assault on an animal rights protester outside the Cloverdale Rodeo this weekend that was posted on YouTube. Steve Rennie of the Canadian Press reports that dozens of people appointed to patronage jobs are breaking federal rules by donating to the Conservative party. A Canadian Press investigation found as many as one of every five chairpersons on the Employment Insurance Boards of Referees gave money to political parties, riding associations and candidates while they served on the tribunal. The federal court has dismissed a union challenge of temporary foreign worker permits that were granted to HD Mining, according to the Tyee’s Aurora Tejeida. Indian Prime Minister Manmohan Singh said yesterday that he had agreed with his Chinese counterpart Li Keqiang to settle a long-running border dispute. The UK Morning Star reports that a meeting between the two leaders took place following a flare-up last month along their joint border. Bradley Manning will no longer be charged with violating the federal Computer Fraud and Abuse Act in connection with the release of a cable known as Reykjavik-13, Major Ashden Fein has told the Associated Press.The cable, which was released to WikiLeaks in 2010, summarized US Embassy discussions with Icelandic officials about the country’s financial troubles. No reason was given for the prosecutors’ change of decision. Manning still faces a charge of aiding the enemy. A pretrial hearing, which began yesterday, concerns classified material that would be used as evidence during his trial starting June 3.